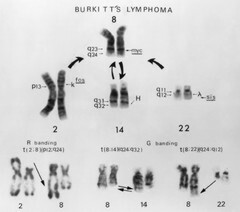 Partial karyotype showing translocations involving Chromosome 8 and Chromosomes 2, 14, and 22. The cellular oncogenes myc, fos, and sis have been mapped to the chromosomal sites indicated. H, k, and x indicate the location of genes for the heavy and light chain immunoglobulins.